KB Express is a Southern Utah convience store chain. 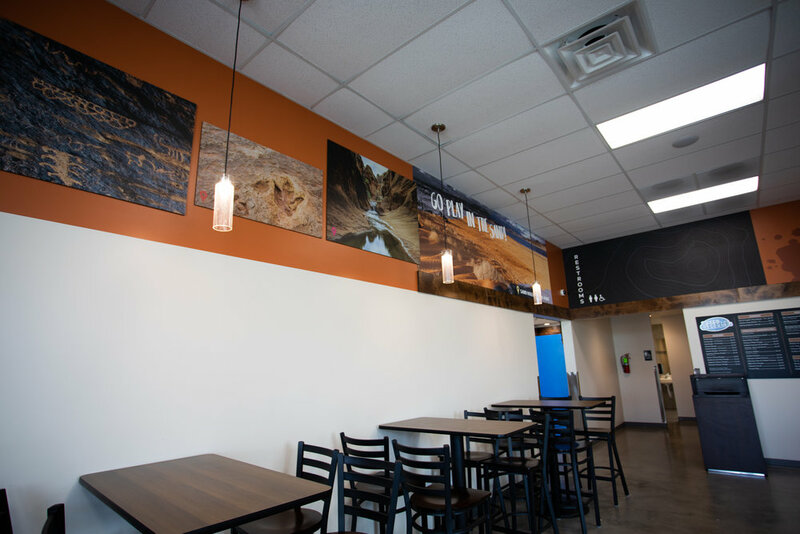 Decorworx was able to capture the customer's vision by tying the store into the local high school and the area’s environment. The previous stores we did for KB Express were heavily tied to the area high schools. We wanted to also include the unique environment of Southern Utah as a tie to the community. Usually, the challenge to a c-store is the lack of valance space. With this store, the challenge was to fill the space. The customer has had success with Decorworx in the past by tying his c-stores with the area high school(logos, color palette). We included the area environment which tied into the color palette easily. We used wood trim, wallpaper and faux stacked stone with EPVC(Sintra) and acrylic letters. We did work with hikestgeorge.com to gather detailed info and photos of area hikes.